Svava Thordis Juliusson interviewed by Tali Dundin at KWT Contemporary on February 5th, 2011. (later aired on ArtSync). 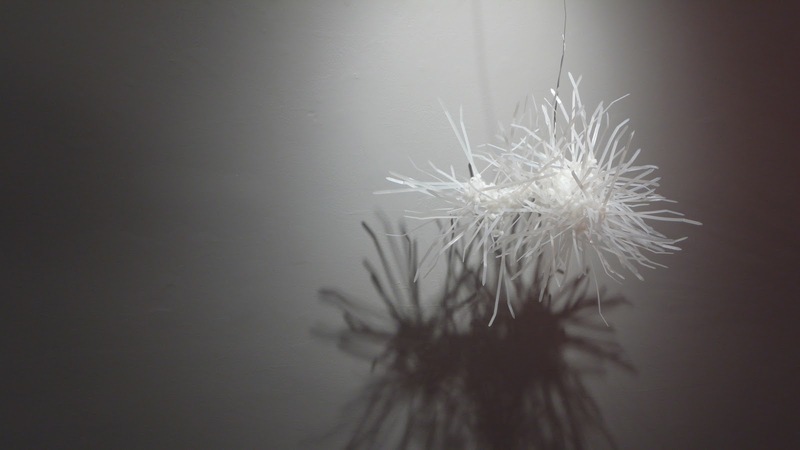 Juliusson is interested in using and manipulating traditional sculpture techniques and various non-traditional sculpture materials to express her concerns and ideas. The studio investigations, which often commence at the kitchen table or the laundry room, tend to oscillate between curiosity and the desire to articulate a response to her surroundings. Current investigations, such as Horizon Orange, are part of a recent shift in her art practice. While still wanting to respond to larger events and domestic situations, the works are executed with a more intuitive approach to material and are primarily composed of plastic such as the cable ties, or safety fencing. These materials are designed for a specific purpose, but once manipulated, or re-purposed, the elements as a new whole, have the potential to become something else, something perhaps found in a natural environment like a cloud or a landmass.